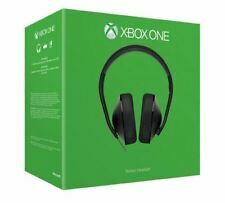 Microsoft Xbox One Stereo Headset Official Gaming Headphones Microphone Black. Microsoft Xbox One Stereo Headset - Xbox Gaming Headset! Make the most of Xbox One gaming and communicate with ease with the MicrosoftXbox One Stereo Headset. The headset can also be used with your PC, tablet or phone so you can add quality audio to whatever you're watching. Xbox One Official Wired Stereo Headset - White. Dispatched with Royal Mail 2nd Class. New open box item which may have a few tiny marks from storage. Please note this has no adapter but will work straight out of the box with the newer controllers with the 3.5mm headphone jack. Easy to set up: No complex wires to your console. Requires sign in to Xbox LIVE to receive the latest console update. Compatible with Xbox One. 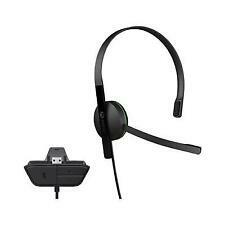 Official Microsoft Xbox One Chat Headset - Black. 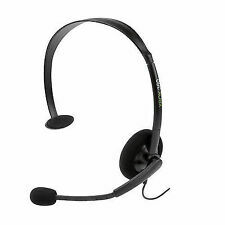 The generic headset that comes with the Xbox One console. Microphone on/off switch and adjustable headband. Connects to controller with a 3.5mm jack. Condition is New (unused). Dispatched with Royal Mail 2nd Class. 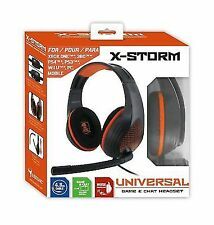 Subsonic X-Storm X-1000 Stereo Gaming Headset with Microphone. Stereo headset with microphone. Adjustable headset. We will advise which is applicable. We pride ourselves on our reputation for ensuring all orders are quickly processed and despatched. I have received my item but I no longer require it?. New listing/BRAND NEW Official Xbox One Chat Headset. Boxed!ONLY £14.99! Tracked! Boxed/!! 4.5 out of 5 stars - /BRAND NEW Official Xbox One Chat Headset. Boxed!ONLY £14.99! Tracked! Boxed/!! 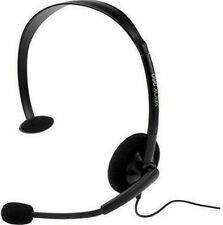 134 product ratings134 product ratings - /BRAND NEW Official Xbox One Chat Headset. Boxed!ONLY £14.99! Tracked! Boxed/!! Stay in touch with your teammates using this single-ear headset from Microsoft. 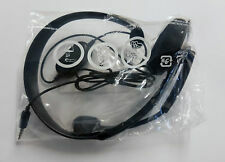 And this headset has an adjustable mic built-in, ensuring that you have everything you need to chat online. It’s simple, it’s good quality and a great gaming headset. Microsoft Xbox One Chat Headset - Black- Brand new never been opened. Condition is New. Dispatched with Royal Mail 1st Class. PRO EDGE X2 STEREO GAMING HEADSET. Select Voice Output to PLAY THROUGH BOTH. Both are genuine Microsoft. Also included is a wireless earpiece unit. Official Xbox 360 headseat, new not been used, no box. In very good condition. will be sent on Mondays due to work schedule Thanks for looking. 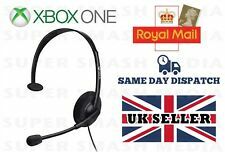 Original Microsoft Black Headset with Boom Microphone XBOX 360 Live-New. Boom microphone can be adjusted for optimal sound quality. Microsoft Xbox One Wired Chat Headset - Black (S5V-00012). Collection in person only. Used in good condition Chat privately with friends whilst gaming. 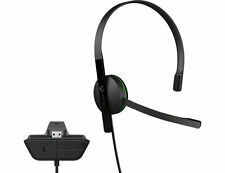 The headset uses wideband digital audio for crystal clear voice chat. Wired - connects to wireless controller.